WARSAW — AcceLINX, the musculoskeletal health business accelerator launched in 2017 by OrthoWorx, will present a webinar aimed at assisting entrepreneurs in obtaining non-dilutive funding to accelerate their establishment and growth. 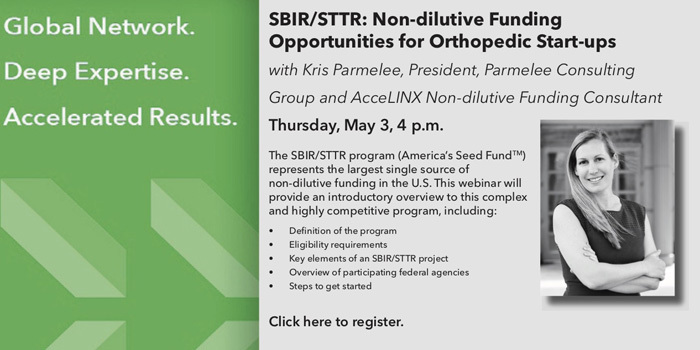 Kris Parmelee, president, Parolee Consulting Group, Inc. and AcceLINX non-dilutive funding consultant, will present the webinar at 4 p.m. Thursday, May 3. Ms. Parmelee will provide an introductory overview to the complex and highly competitive SBIR/STTR (America’s Seed Fund) program. The SBIR/STTR program is a federal grant and contracting program that awards more than $2.5 billion a year to small businesses to support the commercialization of innovative technology. It is the largest source of non-dilutive capital for companies seeking to develop and commercialize innovative technology in the U.S.
Ms. Parmelee has been providing federal grant proposal support services and project management to clients for over 17 years through her independent consulting firm. She joined the AcceLINX roster of consultants in February. She specializes in SBIR/STTR preparations and submissions and has worked on over 250 proposals just in the last 10 years. A graduate of Indiana University’s School of Public and Environmental Affairs, Ms. Parmelee is an entrepreneur herself, launching Lectio, LLC in 2015 to provide an assistive learning technology for children with dyslexia and ADHD. Entrepreneurs interested in taking advantage of the free webinar should go to the resources page on the AcceLINX.com website (http://accelinx.com/resources/) and click on the webinar link in the events section to register. The webinar is scheduled to be one hour long and there will be an opportunity for audience questions. AcceLINX plans to host similar topical webinars periodically throughout the year.